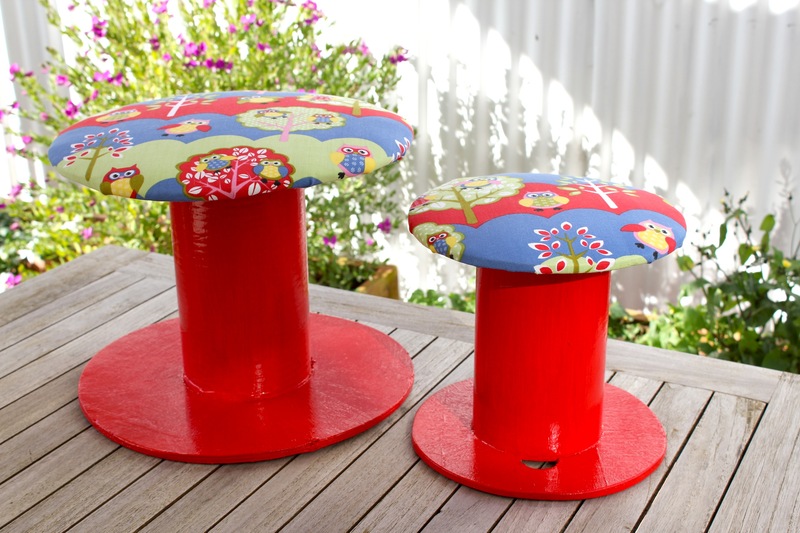 Upcycling – Kids Stool from a spindle | Hey Bernice! 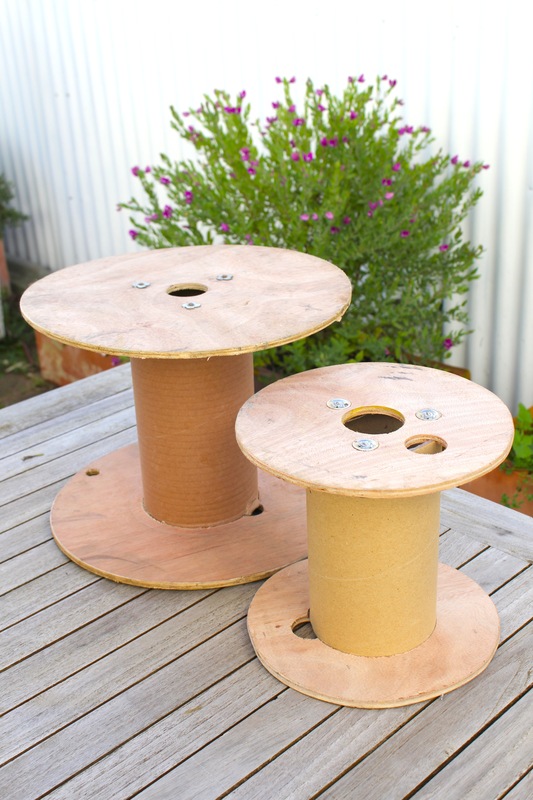 We were showing the progress of the house to my husband’s parents one weekend, when I hear a muffled voice from a head diving into the skip “Hey Bernice, look at these… you could make them into little stools for Heidi”. I didn’t need time to consider this – I was sold. They were in the boot of the car as my (very understanding and often perplexed) husband lets out another sigh! I have been sticking to a ‘touch of red’ theme for Heidi’s nursery, so I knew the base of the stools were going to have to be painted red. I then went on the hunt for some ‘fun’ but not too girly material to cover the seat/top. 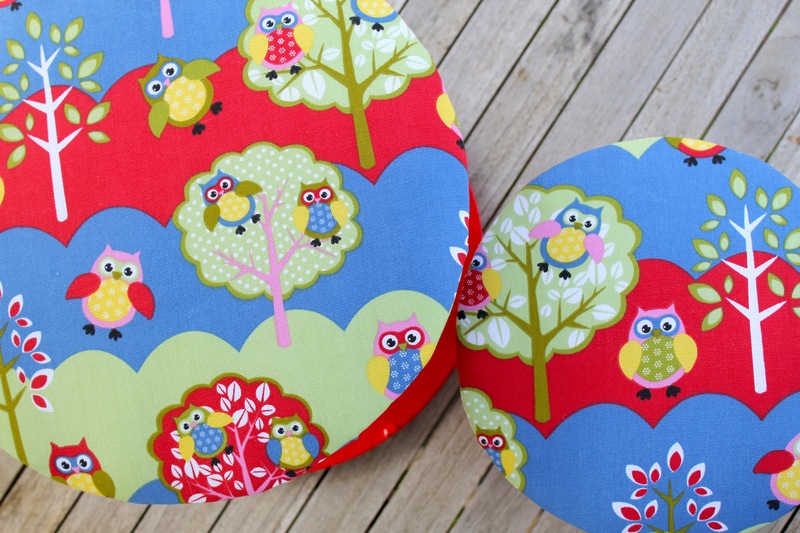 I found this really cute forest and owl fabric at Spotlight… which tied in the red beautifully. I got the paint shop to match up the red in the fabric (it turned out to be Geranium Red) with a high gloss, water based sample paint pot. I cleaned up the spindles with the sander (mainly around the edges of the wood – the outside bits). The piece down the middle is actually made of heavy duty cardboard tubes! I carefully chose which end I wanted sitting on the floor. Knowing we have floorboards in our new house I didn’t want the metal fasteners scratching the floor. One end seemed to have flatter fasteners than the other (although I planned to cover the base with felt anyway, I didn’t want any metal protruding). To ensure a comfy seat for Heidi and her buddies I bought some stuffing. 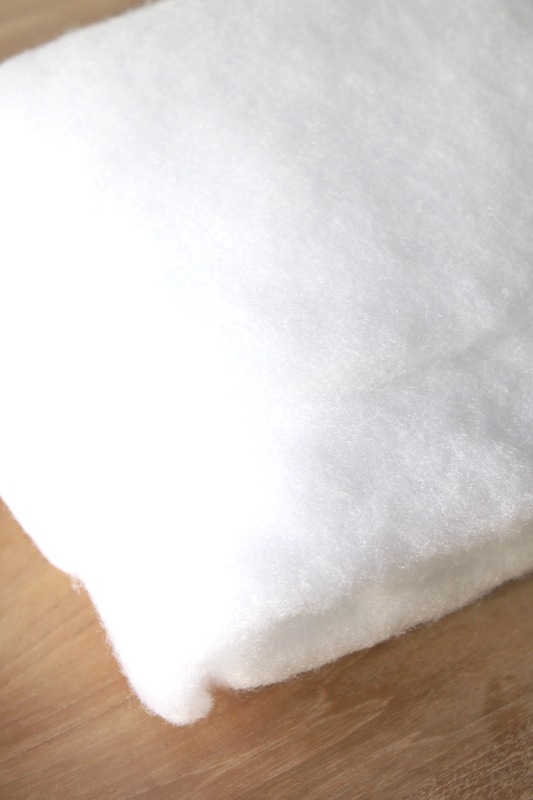 I chose one that comes in sheets, so I could cut it to the right sized circle, and layer it several times to give a bit more cushioning. I placed the stools on the fabric and traced around the top, allowing about 7cm extra material to fasten the fabric underneath the stool top with a staple gun. With all my pieces measured and cut, it was time to put it all together. Placing the stuffing onto the stool, then the material on top of that, I carefully turned it all upside down to start stapling the material in place. When securing the material start with four staples evening spaced around the circle to get the tension right and material spa ced evenly to avoid gathers. 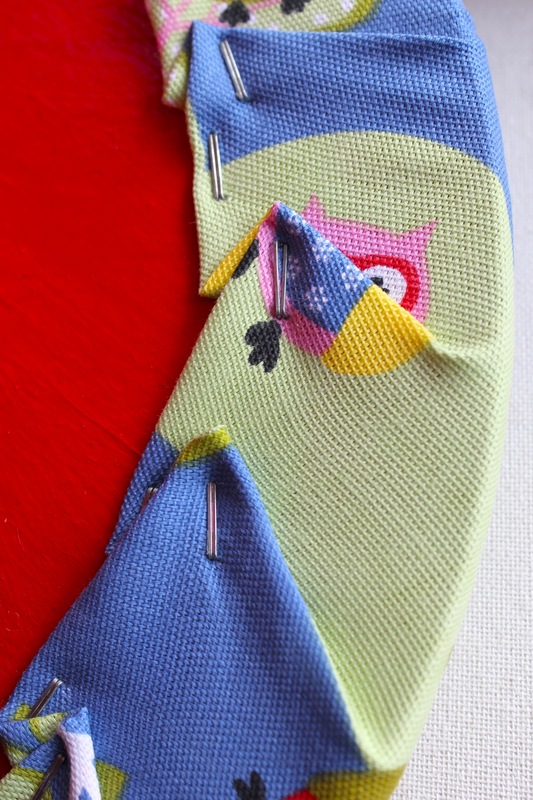 Fold the material under as you staple for a neater finish, and to avoid the material fraying down the track. Once all the stapling is complete you will need to staple and/or glue your felt to the bottom (I chose a felt to match the red paint). This is not absolutely necessary, but will stop any scratches on wooden floors when the little monsters drag the stools across the room! 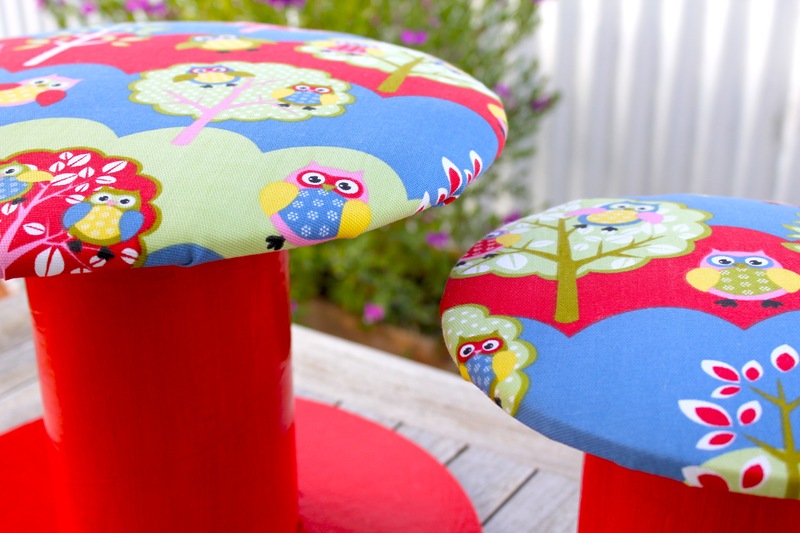 Voila – two tiny stools for my little strudel! 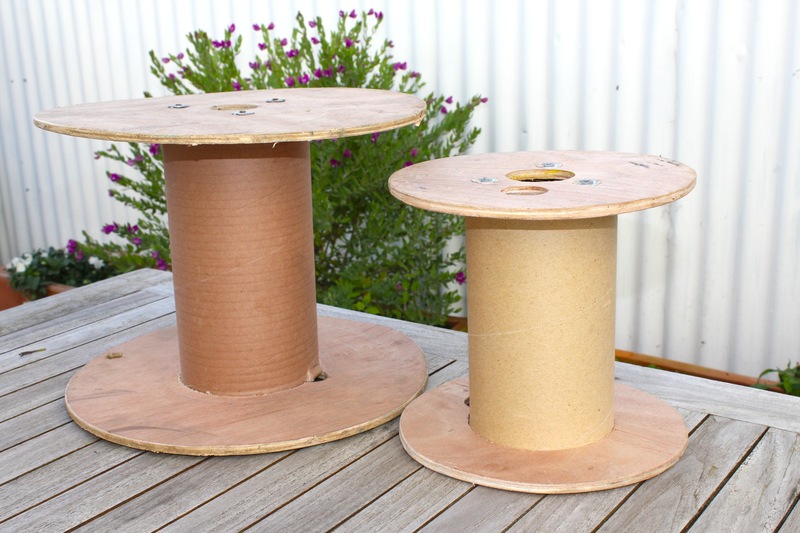 The challenge now is to find yourself a wooden and cardboard spindle to have your way with – good luck! Thanks for the positive words …. I LOVE doing it all, and keeping busy with creative projects makes me love motherhood even more, it’s a little bit of me time! I love the fabric! Found you at Trash to Treasure! Thanks Jane – I got the material at Spotlight (I’m not sure if you are Australian or not – otherwise that won’t mean a thing to you!!) They also have it in a gorgeous light pink version.